This figure, however, represents an intermediate stage in the figure production process. Its made from injection-molded plastic, but, as you might be able to tell from this photo, its torso is one solid piece. Furthermore, its limbs and head are affixed via cylindrical plugs, which fit snugly into corresponding holes in the torso. What is it? Well, by the time of the ROTJ toy line, Kenner had begun producing early-stage injection-molded figures entirely in-house, using relatively inexpensive, low yield aluminum molds. Such figures appear to have partially replaced traditional hardcopies, which both took a long time to produce and were very fragile. We've taken to calling these types of prototype figures "internal first shots," a term which emphasizes their having been produced wholly inside Kenner, as opposed to through an outside vendor, as standard first shots were. 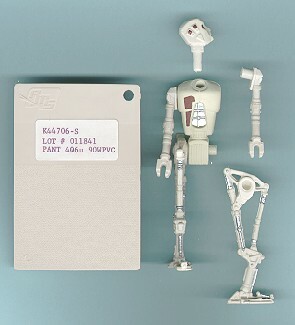 As you might notice from a look at the 2-Up hardcopy of the 8d8 figure, the plugs used to connect the joints and legs of the first shot to its torso appear to have been copied and reduced directly from the metal pins of the hardcopy. Its quite possible that this was done entirely within Kenner. Also included with the figure is a rectangular slab of plastic material, of a color similar to that in which the figure itself is cast. It is believed that this had a similar function to the paint chips found with some "paint masters," which were used to indicate the proposed paint schemes of the production figures. In this case, it is possible that the plastic chip was intended to demonstrate the color of the plastic used to "shoot" the 8d8 figure. This is still a matter of some debate, however.